It seems like everyone and their dog has fond memories of the Star Wars: Battlefront series. I mean, who wouldn’t? You get to have huge freaking battles set in the Star Wars universe and can fly an X-Wing. That alone makes it one of the greatest things ever made of all time anything. Certainly, the lack of a Battlefront III is something we’re all down about, but it looks like we may be in luck. Kotaku has the scoop on Star Wars: First Assault, a sort-of prelude to Battlefront III in which teams of eight (Rebels vs. Stormtroopers) duke it out across the Star Wars galaxy. Naturally, this isn’t a Battlefront game, so vehicles and Jedi won’t be featured. So I’m guessing this is an attempt at the Call of Duty style of multiplayer. Now, this is the interesting part. 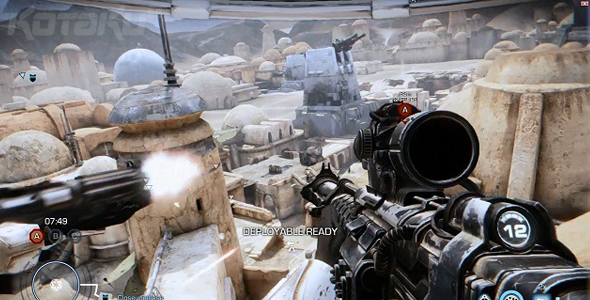 The word on the street is that if First Assault sells well enough, Battlefront III could get made. All of this is rumor and hearsay, and should be taken as that. Especially since the future of LucasArts’ current projects (Star Wars: 1313) are up in the air after the Disney acquisition back in November. But if this is true, and we could see a release of Battlefront III, then count me in on First Assault.